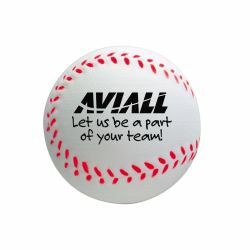 Imprint Method: 1 Color 1 Location - Add some fun to your business marketing with these sports stress balls! Fans of any sport will love this. Add your company name or logo and make your next giveaway stress free! Each stress ball is handcrafted and may vary in size and shape. 100% consistent imprint and PMS matches cannot be guaranteed. Ink will fade with use and base material may bleed through imprint. This product is not a toy and is not safe for use by children under 3 or pets. Size: 2.5 " x 2.5 " x 2.5 "